Our dining hall seating over 300 is fondly known as “The Feeder” which goes along with our bird theme throughout camp. Both breakfast and lunch are served family style, promoting a sense of family and community as we eat together. For the first few days of camp bunk families sit together during breakfast and lunch then we transition to sitting by themes. Campers work together to figure out each theme, which change twice a week. Campers get to know one another as they work together to figure out each unique theme. During the evening we eat a buffet style dinner outdoors, sitting on the grass gathered in circles by bunk family. Manners and general dinning etiquette is emphasized at every meal as it is an important part of living together in a community. Our nutritious menu is personally planned by our chef, taking into consideration children’s taste and daily needs for a balanced diet. Our menu has been reviewed by a nutritionist to ensure our menu offers the best for our camp community. A daily hot entrée is served for breakfast, plus a cold cereal bar with yogurt parfait and cereal options. Hot oatmeal and scrambled or hard boiled eggs are also available daily. Once a week we have “Lazy Breakfast” which is served buffet style between 8:30am and 9:30am, with campers and CITs in their pajamas. This morning is a special treat offering cinnamon rolls, blueberry muffins, donuts, bagels and more! Lunch is our main meal of the day serving a hot entrée with a side of vegetables. A complementary salad bar is also offered at lunch daily. After mealtime announcements, a sweet treat is served for dessert. A camp favorite is Chef’s homemade chocolate chip cookies. Dinner is a fun camp tradition, sitting outside with our bunk families. Our buffet-style meals include Chicken Caesar wraps, Mexican fajitas, Pizza and BBQ’s, followed by a dessert of fruit. A variety of fresh fruit and water are available throughout the day at our “Fruit Table,” positioned centrally in camp. It is a great spot for campers, CIT’s and staff to refresh and chat. We are able to accommodate the needs of campers who maintain a vegetarian or no-red meat diet. 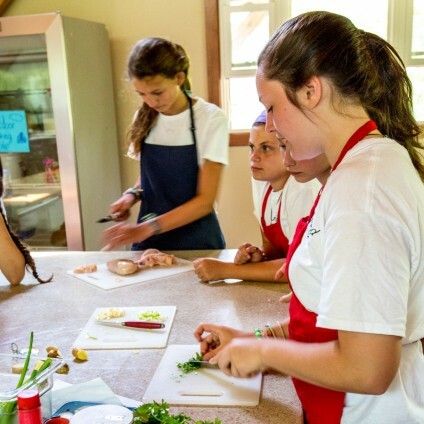 We also provide separate meal options for campers, CITs and staff who require gluten or dairy-free diets. Please include any dietary restrictions on your daughter’s health form to ensure we can provide for her needs. At Fernwood Cove, we are very aware of the severity of food allergies and work to ensure the health and safety of everyone in the community. Fernwood Cove chooses not to prepare or serve any food items containing nuts or nut products. Additionally, we have practices in place to limit exposure to nuts during out-of-camp trips. Please note that we do serve products with other major allergens such as sesame, eggs, dairy, and wheat. Please include any food allergies on your daughter’s health form to ensure that we can provide her with safe food options throughout her time at camp. 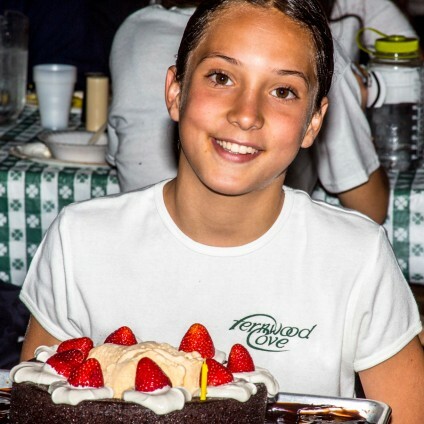 After a birthday serenade from the camp community, campers, CITs and staff enjoy birthday cake with their bunk family. Chef’s special chocolate cake with a center of ice cream topped with hot fudge and strawberries is a true delight! Please note we offer gluten and dairy-free options as needed.